To celebrate the launch of the new lowrider additions, the Lowriders Custom Classics Event Week is now live with some special week-long deals, plenty of Double GTA$ & RP opportunities, a #customclassics Snapmatic contest with a GTA$1M prize, and exclusive Social Club merchandise sweepstakes..
To make it as easy as possible to take advantage, the Double GTA$ & RP bonus for all days (except Monday's Contact Missions) will be matched by a Playlist available directly from the GTAV launch screens. 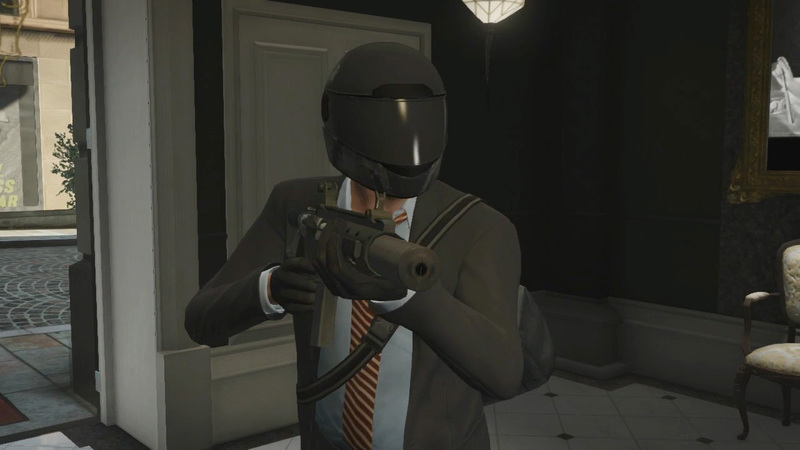 You will still earn Double GTA$ & RP playing these modes outside of the Playlist; the Playlist is simply there to give you a little headstart when you fire up the game. Monday's launch screen Playlist will contain a few Races locked to Muscle and Sports Classic classes, so that you can put your Lowriders through their paces. The Double GTA$ & RP bonus on Monday will be on Lamar's Contact Missions released with original Lowriders. Building out your prized collection of Lowriders with the Vapid Slamvan Custom, Dundreary Virgo Classic or Willard Faction Custom Donk may require some storage solutions that don't come flat-packed. Luckily the fine folks at Dynasty 8 Properties are offering 25% off all Properties with a 10-car garage. Simply hit the Internet icon on your iFruit, find the Dynasty 8 advert at the top of the page and choose the space and location best suited for your new additions. While beautiful hardware to look at, the brand new Compact Rifle and Double Barrel Shotgun won't do you much good when empty. Make sure you visit Ammu-Nation for 50% off Rifle and Shotgun Ammo all this week - you'll need it to unload on anyone that tries to mess with your wheels. The Compact Rifle and Double Barrel Shotgun are both single-handed weapons, ideal for drive-bys from the handlebars of a Motorcycle. To make the most of this awesome ability, enjoy 25% off ALL Motorbikes in GTA Online now through the 24th. Visit the in-game websites for Legendary Motorsport and Southern San Andreas Super Autos and pick up the hog(s) that tickle your fancy. With three new custom vehicles available as part of Benny's spring roll-out, time to make sure you have your Slamvan, Virgo Classic and Custom Donk fully locked and lowered. Spend a week at Benny's to take advantage of 75% discounts on all Bobbleheads, Column Shift Levers and Plaques and put the coup de grâce on your latest ride. After you've worked hard on customizing your new ride, be sure to take a Snapmatic of your pride and joy and enter it into the official Lowriders: Custom Classics Snapmatic Contest by tagging it with #customclassics on Social Club. GTA$1,000,000 will be awarded to the five photographers whose beauteous and clever snaps best represent what the lowrider lifestyle is all about, whether it's tricked out wheels or pairing a new High Top haircut with your dapper new streetwear ensemble. Valid entries are those published from this past Tuesday till end-of-day this Sunday March 20th and have the "#customclassics" tag on Social Club. For official rules, visit here. You're already living like a "G" in GTA Online, so don't miss the opportunity to embody it 24/7 with the latest Social Club giveaway - chock full of gear that reps everything about the classic Sunday Driver livestyle. Five lucky winners will receive a CD copy of The Alchemist and Oh No's Welcome to Los Santos to roll around your neighborhood listening to, a beautiful chrome GTAV Zippo Lighter, GTAV and Rockstar Keychains, and a GTAV Air Freshener to ensure there's no stank in your low-low. To sweeten the pot, the chosen ones will also get their hands on the Grotti Polo Shirt, a Los Santos T-shirt and some official Rockstar and GTAV Stickers for good measure. Take yourself to the Social Club Events Page now for a shot at this engine-revving package. 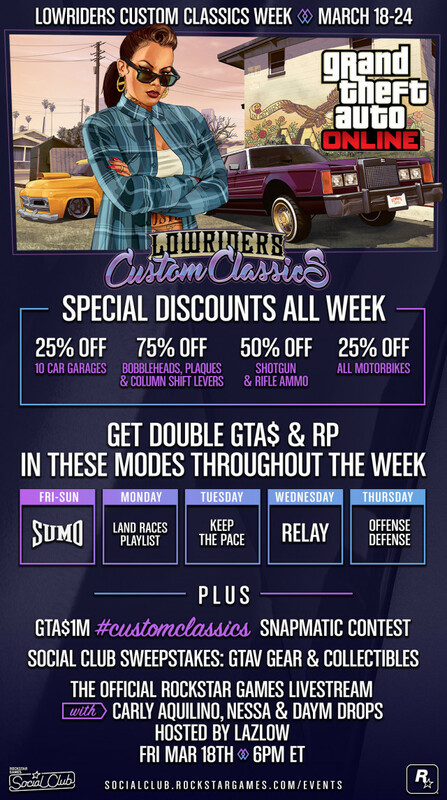 Lowriders Custom Classics Event Week - Another week of discounts and bonuses for new-gen GTA Online to celebrate the new lowrider additions.